In PUREMMT We care who in the Private Sector gets to save all the Gov’t Deficits $$$s. Not just in the US but Worldwide since we live in a Global economy. Unfortunately, it is the top 5% who get to save and speculate on asset prices such as stocks and Bonds. 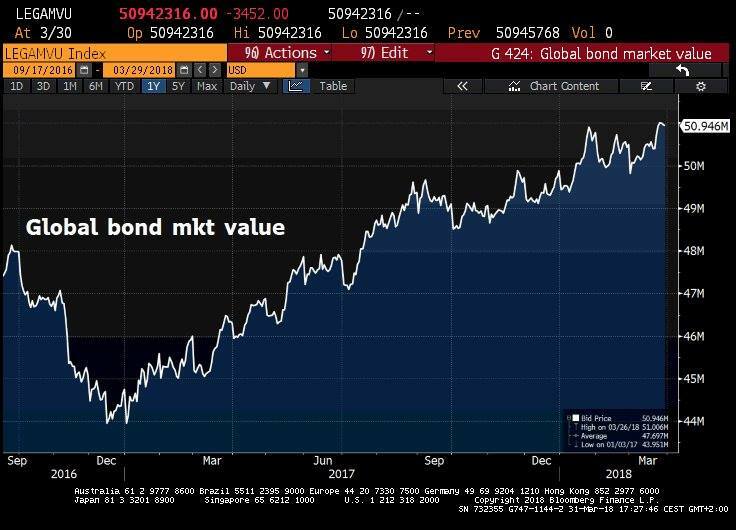 The chart below is the current Global Bond Market Value nearly $50 trillion. Does the average bricklayer, bus driver, own bonds or the Jamie diamonds of the World? Next time, some FAKEMMTER tells you the deficits are too small. Ask them where did the top 5% of the population find $50 trillion alone to invest in Bonds? Do we need the Gov’t to print more and give them more? Or is it time we seriously address the Savings bubble and find solutions that don’t involve “printing” and more private debt for the 95% and more savings for the top 5%? There is no FREE LUNCH with MMT for the 95%. Only for the top 5%. SORRY!